Quite the change, right?! I went with my favorite black paint, Wrought Iron by Behr. That’s actually the color I used to paint the doors inside our house too. (You can see those transformation in this tutorial here and here). You guys know I’ve been loving the white and black contrast lately, so I’m really with happy this change. It took me about three hours to do two coats of paint on both doors, plus the molding and trim. I didn’t use primer because the door was previously painted with latex paint, so I knew it wasn’t really necessary. I also spray painted our little door bell cover black just to freshen it up a bit too. All in all it was super simple and easy. Not too shabby for such a big change! Thankfully my five-minute decision to paint these doors turned out to be a good one. I’m loving this change and I feel like it’s such a clean, crisp look compared to what we had before. 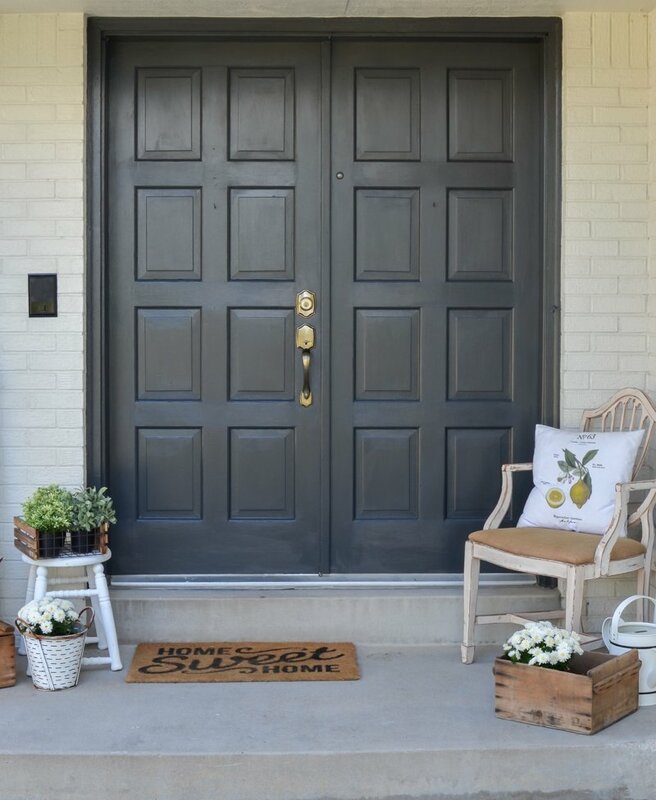 And you guys, this is such an easy and simple way to spruce up your porch. 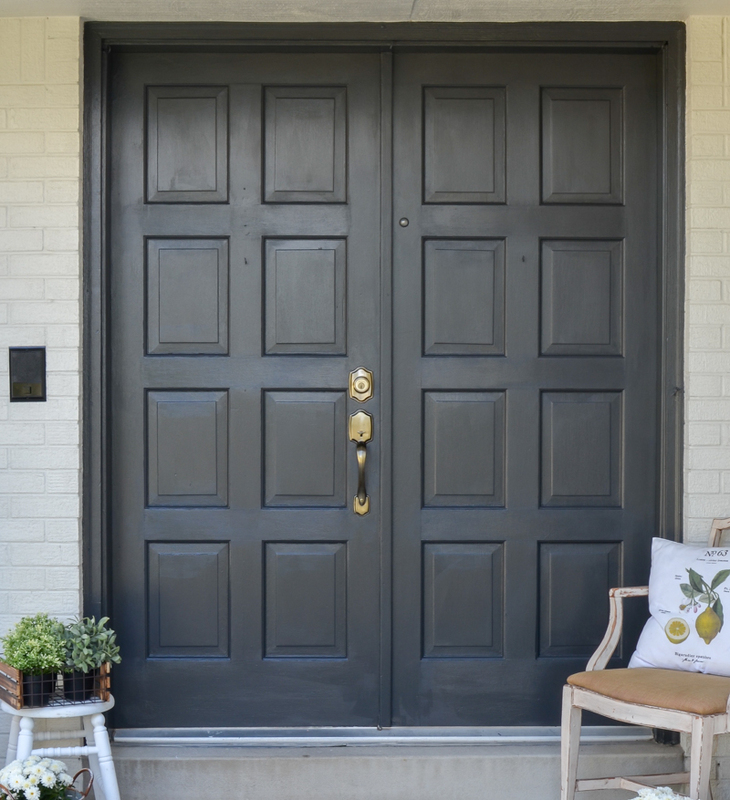 If you haven’t painted your front door in a while you might want to give it a shot. It’s a quick DIY project! And now I realllllllly can’t wait to get fall decor going out here. I’m still a little ways off from doing that, but this space will be overflowing with pumpkins very soooooooooon! Looks great Sarah! I have been thinking about that project here. My home is a soft Palestinian of yellow. My shutters are a brick red color. I love aqua and thought that would be a nice contrast. What do you think ? Go ahead just hit me girl!!!! I think aqua would be super fun!! I say go for it. You can easily re-paint it when you’re tired of the aqua. Do it! That was so funny Becky…I’m still smiling. I love it! 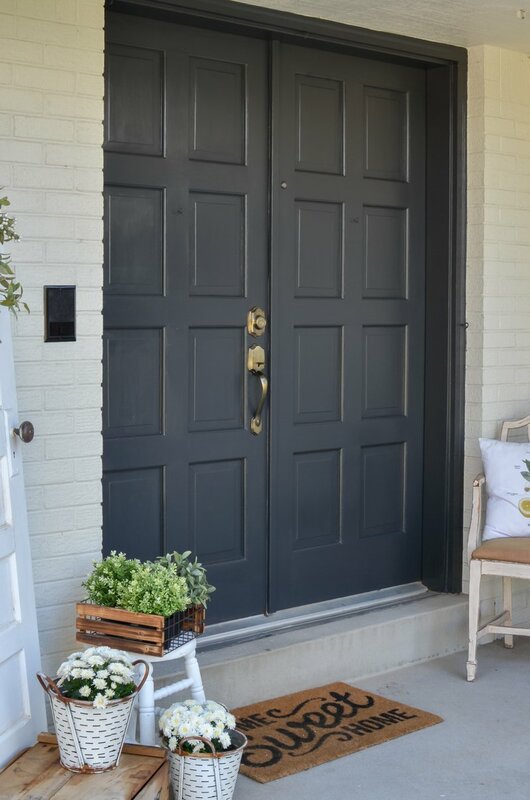 I can’t believe it but we just painted our front door black last weekend, it was red and didn’t match our brick at all, it looks so good now! Was your house white brick when you bought it or did y’all have that done? I love white brick. I would love to see the outside front of your house I love everything you do! We had it painted white not long after we moved in actually. I need to share updated pics of the outside sometime! 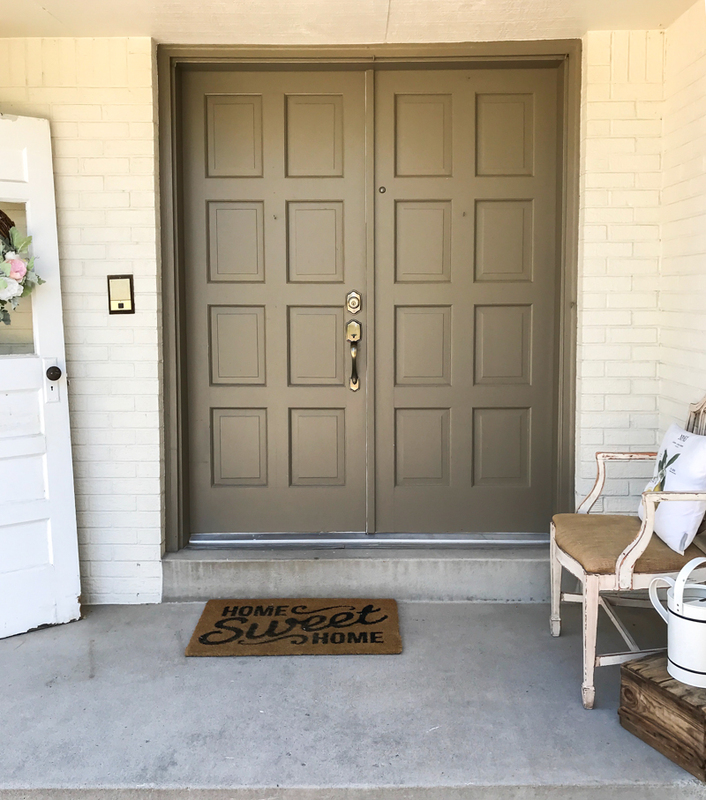 Love the new paint color for the front doors! It really does make a wonderful look! 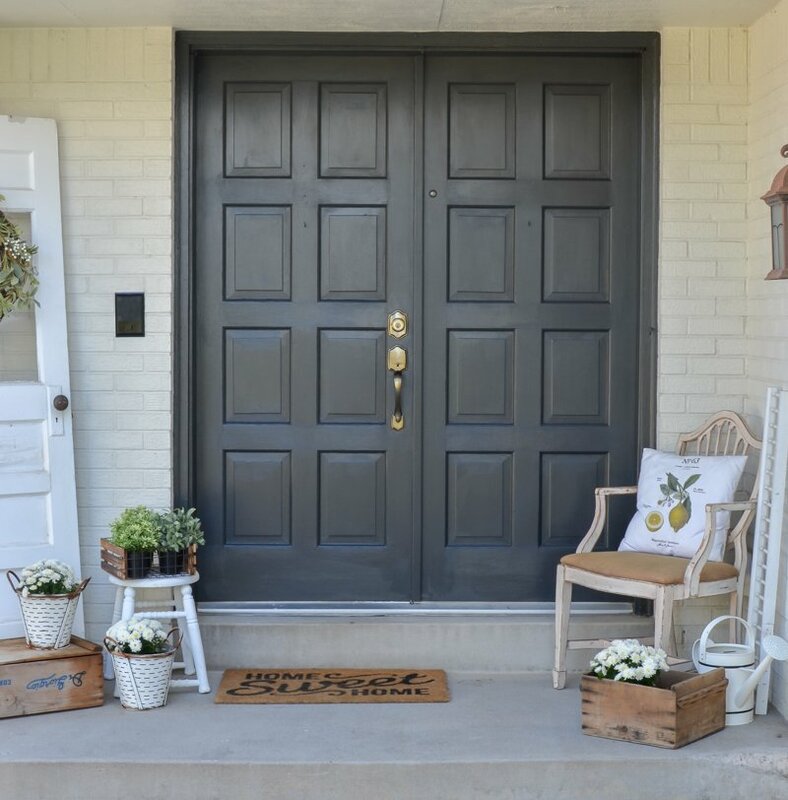 I repainted our front door last month too and am so happy I did. I love transformations! 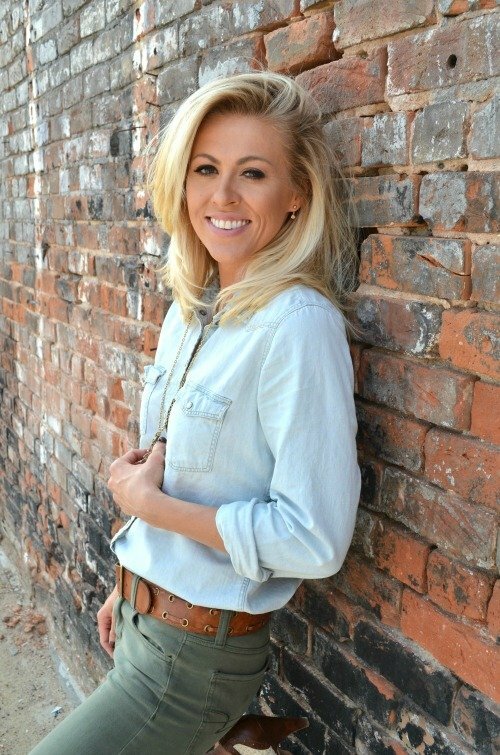 Going from nice to fabulous is a game changer! Oh that’s awesome Laura! Isn’t it crazy how just a change in color can make such a huge difference?! Perfect timing! We are having a new door installed TODAY ( the old one was original to the house and had plastic mouldings of dragons or lions…not sure which!) and our new door will need a coat of paint..or two. I am leaning towards a cheery yellow or a pale green to go with our dark brown brick exterior. So excited to see that change, especially as this new door has windows in it and will brighten our dark hallway a lot! Any suggestion as to what type of paint to use? I am assuming exterior but is oil necessary? I didn’t use exterior paint but you totally could! And I don’t think oil based paint is necessary either. This was premium latex paint & primer in one. Wow! I can only I imagine how gorgeous it will be with a pair of matching wreaths for fall! Yes I totally agree Debbie! I keep a huge list of all the projects that I want to do around the house. I usually completely ignore it and end up doing all the spur of the moment projects. 😂 Painting our front door is on the list, so maybe I should actually tackle it. Love the door! I am getting ready to paint mine black. Did you use a satin or semigloss finish? 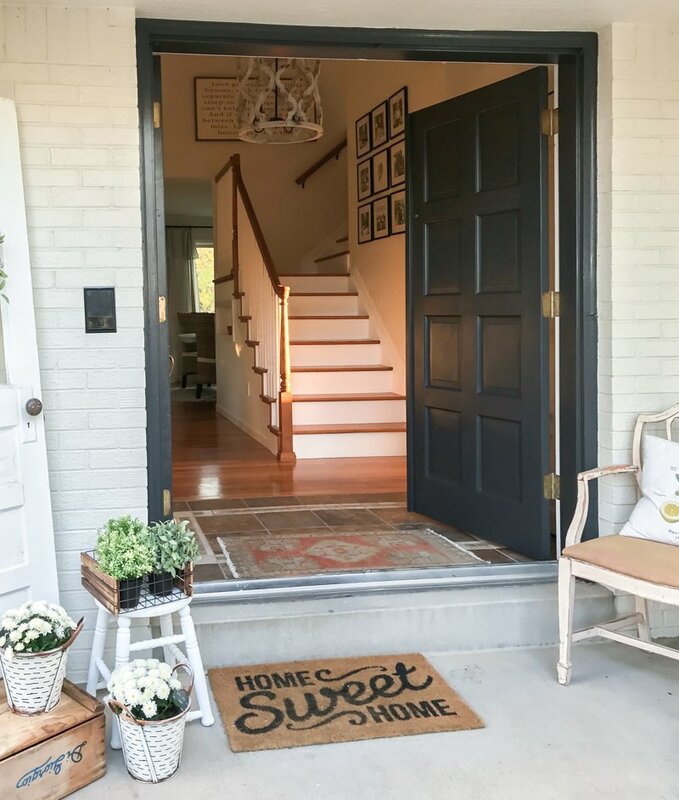 We need a new door, but painting the old one could help us last a little longer. Did you take doors off hinges? If so, did you hang something up such as a curtain to block entry from pesky insects?! I do Not want any wasps entering the premises!! I didn’t take the doors off the hinges, I just left them on. We don’t have a ton of flying insects to worry about, so I just painted with the door open! But you could definitely hang something up to block them from coming in. Love love love it! Mine is currently red…and I just can’t change it! Everyone loves my red door with white siding and black shutters! But ready to do Fall decor too! Oh I bet that looks so pretty Linda! !